Want a better place to work? The holiday season provides countless opportunities to express gratitude. For some of us gratitude is the very spirit of the season; depending on our tradition, we express gratitude for spiritual gifts (Christmas), for deliverance and rededication (Chanukah), for the bounty of the earth (Kwanza), or simply for the goodness of friends. For some of us, however, gratitude is an awkward and painful chore. Gratitude is a learned virtue. We teach it to our children with unwavering zeal, taking every opportunity to remind them, “What do you say?” But as adults we often forget to focus on its practice beyond the social norms of politeness. We might say thank you, but do we internalize and mean what we are saying? Over the past 10 years we have used the best in gratitude research in many of our leadership development programs. So why are we teaching gratitude to leaders? It works. Leaders have shared comments with us about the value of reigniting the practice of gratitude in meaningful ways. One department director wrote to tell us that focusing on gratitude prompted his family to ask, why are you so happy, dad? A public school principal in a neighboring county reported that the school culture had undergone a dramatic change as a result of a refocus on gratitude – people like coming to work! Science supports these findings. Led by Robert Emmons, professor of psychology at the University of California (Davis) and founding editor-in-chief of The Journal of Positive Psychology, researchers at The Greater Good Science Center (GGSC) report there are a number of principles to consider about expressing gratitude and how it might affect leadership effectiveness. Here are three. 1. Gratitude makes our workplace better. Not only does gratitude help us individually and our relationships, it can also shift culture in positive ways. In a review of more than 50 studies researchers found that “gratitude produces joy, enthusiasm, and optimism, [rather than the more destructive emotions] of envy, resentment, greed, and bitterness.” Managers who cultivate a culture of gratitude in their teams can positively impact culture—as our principal found—where people like to come to work. Not surprisingly, then, Globoforce, in a 50-country study, linked gratitude to productivity, profitability, quality, loyalty, safety, and absenteeism. 2. Gratitude is important for forming new relationships. Forming new strategic relationships is key for leaders. The science of networking, pioneered by Professor Brian Uzzi (Kellogg), has shown the power of connections in leadership and organizational success. It is definitely important “who” you know! What is interesting is that expressions of gratitude can help build stronger, more meaningful and reciprocal networks. The work of Michael McCullough (University of Miami) a previous Faculty Series presenter for The Center, supports the concept that expressions of gratitude make us more open to the contributions of others and help in building social bonds and strengthening networks. 3. Gratitude provides better sleep and leads to better decisions. Ever been asked, “What keeps you up at night?” As leaders our decisions are often the difference between success and failure. Findings from several studies suggest that a “conscious focus on blessings helps us sleep better and longer at night.” Not only do you feel more rested, but you’ll make better decisions and even treat people better. Somewhat ironically, we often sleep less when we really have to perform at a high level, but this is when we need it the most. Want to short-circuit this process? Gratitude is likely to help—strange as it might sound to those of us who are skeptics. Set a daily timer on your phone to stop and appreciate what is going well each day. 30 seconds and you’re done. Keep a notepad or journal by your bed – jot down a couple of things you appreciated about that day: a sunny afternoon, a job well done, a compliment received. Write a note of thanks. The simple act of writing and expressing these feelings strengthen our neural pathways. And the person you give it to might also really appreciate knowing that you are thankful for them. Just do it! Look for opportunities to be grateful – there is always something on which we can focus. So, maybe consider a New Year’s resolution that could make your work life better; make a 2% shift in your focus and practice gratitude in one or two small ways. Break the entitlement cycle by practicing gratitude, and see what happens. To find more tips on keeping a gratitude journal or maximizing opportunities to practice gratitude, you can visit Berkeley's website. To register for The Leadership Lectures with Christine Porath on March 7, “Civility in the Workplace,” RSVP here. 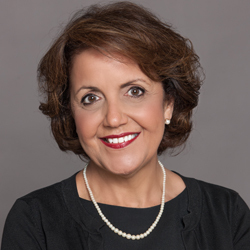 Mayra Beers, Ph.D. is Director of Strategy and John S. and James L. Knight Research Fellow for the Center for Leadership at Florida International University (FIU). She holds MA and Ph.D. degrees from FIU and her work has been recognized with numerous awards including the prestigious James R. Scobie Memorial Award, the Jay I. Kislak Foundation Prize, and a Mellon Foundation Fellowship, and numerous best paper awards, among others. Dr. Beers also holds Certificates in African New World Studies and Latin American and Caribbean Studies. She has presented her work at the several prestigious venues including the Carolingian University in Prague, the American Historical Association (AHA), The Carnegie Center for the Advancement of Teaching, and the Latin American Studies Association (LASA). In recognition of her service to Florida International University, she is also the recipient of the Presidential Excellence Award, the University’s highest honor bestowed to faculty and staff.